In very good order, a WW1 1908 pattern British cavalry trooper's sabre, scabbard marked for 5th Royal Irish Lancers, original sword knot with Totenkopf (skull and crossbones) for the 17th Lancers. 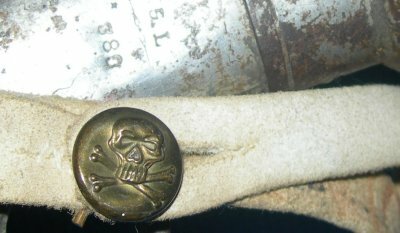 The scabbard is marked to the 5th Lancers, the sword knot with an exceptionally rare 17th Lancers sword knot skull and crossbones badge, sword made by Wilkinson, dated January 1912. Is the sword a 17th Lancer's sword? I suspect not. I suspect a trooper of the 5th Lancers was reassigned to the 17th, hence the sword knot and Totenkopf. As the 5th were mostly static in the trenches while the 17th served as a dynamic regiment of horse to fill gaps in the forward line when needed, this makes most sense. The sword and scabbard obviously has been cleaned of its once war time camouflage paint. 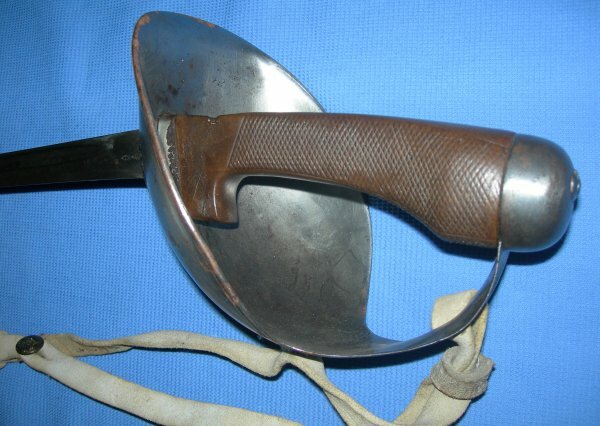 The 34 1/2 inch Wilkinson marked blade is in good condition and firm in the hilt, with various ordnance marks. 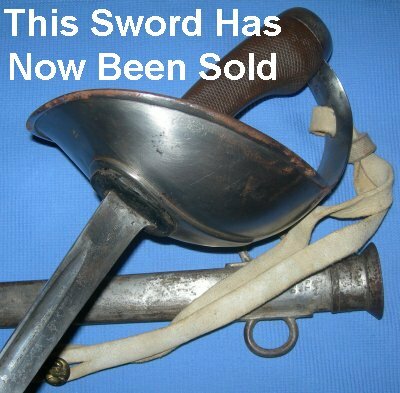 The steel bowl guard and grip both in good condition also. The steel scabbard with some dents / dings, but good overall. The sword draws and sheathes well. The sword knot a a very rare 17th Lancers Totenkopf may actually be worth more than the sword. Further / full sized photos available upon request. Item Ref: 881.